The lawn defines your garden by providing contrast to hard surfaces, flower beds and borders. Its shape can express your style; square or rectangular lawns seem formal, irregular shaped lawns are more casual and fun! Curves in lawns should be designed with mowing ease in mind. The type of grass you choose will be determined by the area of the country you live in and by how you are going to use your lawn. If you keep to a regular lawn care program your lawn will be healthy and easier to maintain. Cool Season Grasses: These include Kentucky Bluegrass, Tall Fescue and Perennial Rye. Cool season grasses stay green during the fall, winter and spring but go dormant in the heat of summer. Warm Season Grasses: These include Zoysia, Bermuda, St. Augustine and Buffalo grass. Warm season grasses will be green from late spring until fall and then go brown when the weather starts to cool. Where you live will determine what kind of lawn grass is best for your area. Those who live in the transitional area should choose grass varieties that can handle both cold and hot weather conditions. Check with your local garden center. They should be able to provide you with grass seed mixes that will perform best in your zone. Which grass varieties are best in your area? Visit the National Turfgrass Evaluation Program's (NTEP) state-by-state guide. Fertilize with a slow-release organic fertilizer such as Milorganite. Weed Control: spray to kill broadleaf weeds. Mowing: Mow up left over winter leaves. Fertilize with a slow-release organic fertilizer such as Milorganite, Earthalizer, Converted Organics or Chickity-Doo-Doo. Weed Control: Apply a pre-emergent weed control by April 15th if not done in March (see below). * Spray broad-leaf weeds as necessary. Mowing: Mow grass at 3-4", leave clippings on yard if possible. Fertilize with a slow-release organic fertilizer such as Milorganite, Bradfield's Alfalfa Fertilizer, or Fertilome Classic Lawn Food. 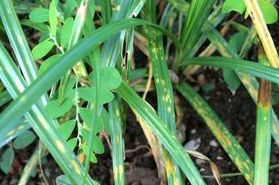 Weed Control: Last chance to apply a pre-emergent weed control. Continue spraying for broad-leaf weeds as necessary. Grub Control: In mid to late May apply Imidicloprid or Mach II. Mowing: Frequently as necessary. Do not remove more than 1/3 of the leaf blade. Fertilize with an organic slow-release fertilizer if not done in May. Water: deeply but infrequently as needed if spring rains are scarce. 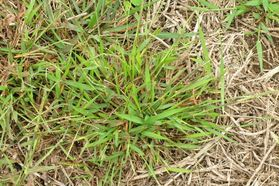 Weed Control: use Sedge Hammer to control nutsedge. Spray for broad-leaf weeds as necessary. Insect Control: Apply grub control if not done already. Use Deltamethrine to control fleas, ticks & chiggers or Yardsafe Natural Cedar Insect Repellant every 30 days. Fungus Control: Apply F-Stop systemic fungicide to prevent brown patch, dollar spot, reapply in 30 days or spray Seranade Lawn Disease Control as an organic option every 7-10 days. Mowing: Continue mowing at the recommended height of 3-4", increase mowing height by 1/2 - 1" if grass is thin. Watering: make sure lawn gets 1" of water once a week. Water between 6 & 10 a.m. to reduce week occurance. Never water at night. Weed, Fungus and Insect Control: Apply as needed if not done in June. This is the month to prepare your lawn for fall seeding! Weed Control: Spray broad-leaf weeds, wait 3-4 weeks before seeding. Insect Control: Check for grub damage. Use Dylox as a late season grub control. Watering: Soak your dormant lawn the last week of the month to start fall growth. Note: If planning on a total lawn renovation, kill off your entire lawn in mid-August using glyphosate (Round Up). This is the best month for seeding your lawn. Weed Control: Do not apply any weed killer until you have mowed your new lawn twice. Fertilize with a slow release organic or seed starter fertilizer if seeding. If not seeding apply your first Winterizer fertilizer application. Apply 1 1/2 pounds of nitrogen per 1000 square feet. Aerate soil if soil is compacted. Fertilize with Winterizer fertilizer, Milorganite, Earthalizer, or Chickity-Doo-Doo in mid-October. 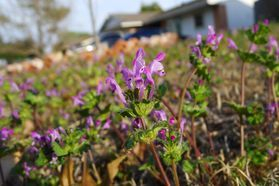 Weed Control: Apply Dimension or Prodiamine to prevent winter weeds like henbit and chickweed. If using Prodiamine you will not be able to seed in the spring. Mowing: Continue mowing at recommended height. Mow up fallen leaves. Fertilize: Apply your 3rd Winterizer fertilizer application. Three applications in fall are recommended. Mowing: Continue mowing up fallen leaves. Get your lawn mower serviced so that it is ready for spring mowing! Rest and enjoy your winter break! Why NOT to use Weed & Feeds! Granular Weed and Feed products are typically used in the spring when your lawn does not need to be fed. Additional fertilizer at this time encourages top growth which stresses the lawn and makes you have to mow more often. Also, in order for the "weed" component to work the granual must stick to the weed leaf...this is not very effective. Using Weed & Feed is a waste of time and money. 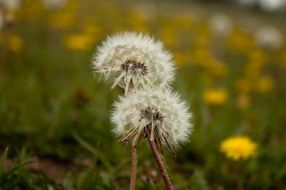 Instead simply spot spray or pull any weeds that you may have and save the fertilizing until fall! 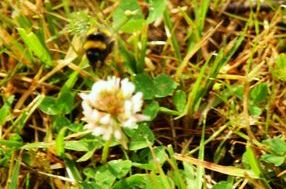 *Pre-emergent Weed Control Tips! Please read the following tips if you are planning to reseed your yard. Prodiamine (Barracade): Lasts all season, controls broad-leaf and grassy weeds, you must verticut in the fall if you plan on seeding. Dimension: Lasts 3-4 months, controls crabgrass and some broad-leaf weeds. Team: Lasts 8-12 weeks, usually used if you missed putting down Prodiamine or Dimension. Tupersan: Use if you plan on spring seeding your lawn, only lasts 3-4 weeks, second application may be necessary. Corn Gluten: Use as a natural herbicide, cannot be used within 60 days of spring seeding. September is the best month of the year to renovate your lawn. This is because daytime temperatures are cool but soil temperatures are still warm...ideal conditions for growing grass. Mow your lawn short and bag clippings. Verticut or power rake the area to be renovated. The goal is to get good contact between seed and soil. Apply a seed starter fertilizer at recommended rate. Do not use high nitrogen fertilizers at this time as they will burn your new seedlings. Top dress with straw to hold in moisture and keep the seed in place. WATER! This is the most important step. Water 2-3 times a day just enough to keep the seed moist. If the seed drys out it will die. Do this until the seed germinates. Then reduce watering until the grass is established. Seeding vs Sod: There are several factors to consider when deciding whether to seed or lay sod. Initially seeding is less expensive. Also, you will have more choices in grass varieties when seeding than when using sod. Seeding, however, can be more risky. Seed exposed to adverse weather conditions can be difficult to germinate. Sod will give you instant gratification and if you have a sloped yard will help to control erosion. As a rule it is better to sod in spring and seed in fall. Choosing Grass Seed: Remember you get what you pay for! Cheap grass seed often contains annual grass and other less desirable grass varieties. Check with your local university horticultural extension service for varieties that are best suited for your area. Reliable garden centers also will carry grass seed varieties that are proven hardy. All bags of grass seed should be labeled with what kind of seed and the percentage of each it contains. There should also be a date as to when the seed was bagged. You will find grass seed bagged in different ways. Seed may be labeled as a "Blend." Blends are combinations of two or more varieties of the same kind of grass. You will get more disease and drought tolerance in a blend as opposed to a bag of only one variety. A "Mix" is a combination of two or more different types of grass; i.e., bluegrass and fescue. A grass mix is the ideal choice as the combination of different types and varieties of grass will provide the best protection against disease and increased durability to adverse weather conditions. Planting Zoysia: Zoysia is a warm season grass which spreads vigorously, is low maintenance, and generally resistant to disease. 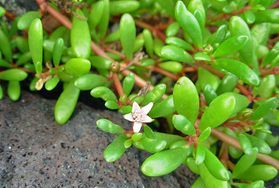 It is purchased as a pad or plugs instead of seed. To plant Zoysia cut your pad into small pieces or purchase plugs. Plant the plugs every 12 to 18 inches. Keep the area watered until the plugs are established and spreading. This is usually about 4 weeks. Zoysia is actively growing during the hot summer months and brown during the winter. You will fertilize your Zoysia after it greens up in May and then again one month later with a high nitrogen fertilizer. To keep your Zoysia lawn healthy aerate every 3 years to reduce thatch. Mowing height and frequency are crucial to the health of your lawn. Cutting your grass too short stresses your lawn, encourages weeds and leads to lawn deterioration. As a rule you should never remove more than 1/3 of the green leaf area in a single mowing. Lawn clippings do not always need to be removed. Short clippings left on the lawn will decompose and return nutrients to the soil. Tall Fescue: Spring 2-3.5" Summer 3-4" Fall 2.5-3.5"
Bluegrass: Spring 1.5-2.5" Summer 2-3.5" Fall 1.5-2.5"
Perennial Rye: Sp. 1.5-2.5" Summer 2.5-3.5" Fall 1.5-2"
Creeping Red Fescue: Sp. 1-2" Summer 2-3" Fall 1-2"
Don't rake those leaves. Mow them! It never fails, the first warm spring day and your lawn suddenly goes from 3 inches to 6 inches tall in one day! You go out to dust off your lawn mower, and it refuses to start. How frustrating! There are a few steps that you can take in the fall to make sure that this doesn't happen to you. 1. Run your engine dry or add a gasoline stabilizer to the fuel tank. Leftover gasoline can become gummy if left in the tank unused. 2. Drain and replace the oil. Oil should be changed once a year. Disconnect the spark-plug wire first for safety. 3. Clean the air filter. Wash foam filters in hot, soapy water. Blow clean paper filters. 4. Clean & inspect your spark-plug. Place a small amount of engine oil in spark-plug hole to reduce corrosion. 5. Clean and sharpen the blades. Sharpen your blades. Clean off any dirt or grass clippings on the under-carriage of the mower.